I started my Sockapalooza pal's socks this week. Panda Wool plus a pattern of my own design equals hours of entertainment. 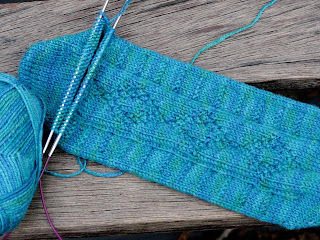 I consorted with dear Barbara Walker to find a stitch pattern combo and am very pleased with how the sock is turning out! Toe-up, short-row heel, magic loop...perfect. 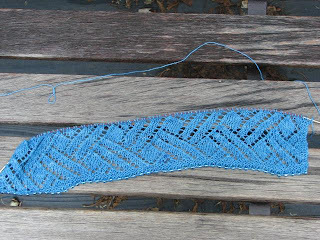 I also started some new lace this week...the Hanami shawl, which will be for my sister. Since she has wool issues, I'm using Conjoined Creations Pastimes laceweight soy silk, which is just absolutely heavenly!! I can't even express how much I am loving this yarn. I don't know if it is just because of the fiber content or what, but it doesn't even really need to be blocked! I will anyway, of course, but you can see in these pictures...it just lays flat and does exactly what it's supposed to do. I have not steamed this and it is not stretched or held taut. It is laying in it's relaxed state. Lovely socks! The colour is gorgeous and really shows the pattern well. 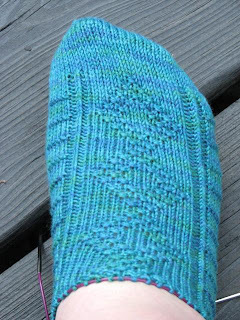 I so want to try toe-up socks myself! The socks are very pretty and the shawl is beautiful. I love the yarn! good job on the socks! I'm in love with your new yarn though, that is GORGEOUS!!! 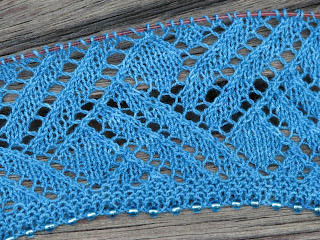 And that shawl is gonna be beautiful. You have a lucky sister. Your pal gets wonderful socks. They are everything I cannot do (or did not try patiently enough? ): Toe up, Short Row Heel, Magic Loop. I love the Great Adirondack Yarn the colours are fabulous. Thanks for the link. Those are some pretty spiffy socks (I love the different shades of blue). I feel like such a slacker. I haven't gotten my yarn yet. The socks look great. You have a lucky sock pal! Beautiful socks, you should be proud! I'd love to be your sock pal... maybe I am! What gorgeous socks! I have to try magic loop one day. 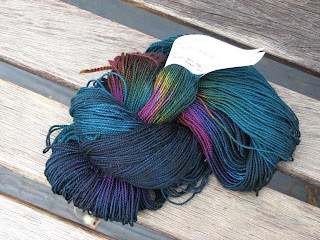 The colours in that yarn look like an oil slick - in a very good way! Gorgeous lace; your sister is one lucky gal.